When fishing in Punta Cana you are subject to catch very large gamefish. Fish weighing in at hundreds of pounds plus are quite possible. With a full party on board, with all your gear, food and drinks you want some room to move around while onboard. A full party of 7 anglers, 3 riders, and the fishing crew is quite a large crew and nobody wants to be stuck on a small craft with no elbow room. 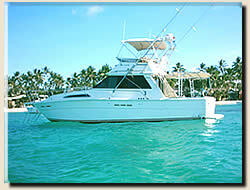 That is why our Punta Cana fishing boats are roomy, with a wide beam, and not one of our boats is under 33 feet long. There are roomy luxury cabins for lounging, plenty of fishing room, and they are equipped with state of the art and up-to-date electronic safety and fishing equipment. 4- Loaded with all up to date safety gear for your complete safety. 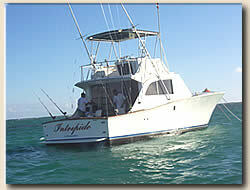 All your fishing gear and fishing equipment is provided by First Class Fishing for all Punta Cana charter boats. All your soft drinks are provided too. 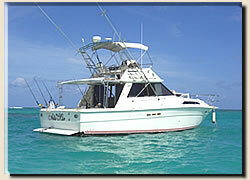 Below is a list of a few things that you should bring on your Punta Cana charter fishing trips. Bring a small cooler for food and drinks. Ask your Punta Cana charter boat Captain how large of a cooler you will need. You can buy a small cooler in the Dominican Republic when you arrive. A sports bag is a good idea to bring for carrying your gear, hat, glasses etc and other personal items that you need on a Punta Cana saltwater charter fishing trip. 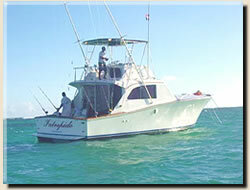 Your Punta Cana fishing charter will provide all soft drinks for your trip. When you reach the Dominican Republic ask the owners or Captains about food arangements. If you will be fishing in foul or rainy weather then you may want to bring a very light weight wind breaker or rain jacket. Bring sun glasses. Preferrably polarized fishing glasses to lessen the sun's glare that reflects up off the water. Tropical sun can burn you very quickly and bad sunburn can ruin your fishing trip. Bring a camera to take snapshots of those big fish you catch or video of the beautiful Punta Cana beaches, the tropical setting, and the many other beautiful sights in the Domincana Republic and the Punta Cana area. The Punta Cana region can get very hot. Make sure you bring sunscreen, especially if you easily burn. If you are burnt up you can't enjoy your Punta Cana charter fishing trip or the rest of your vacation. You probably already paid for the trip but you should make sure you have some cash in pocket so you can tip the First Mate. Being Mate on a charter boat is not easy work and these guys deserve every dime they get. Tip them well!